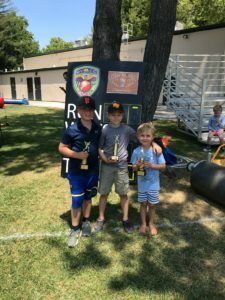 The Napa Valley Cricket Club (NVCC) wrapped up their seventh season with a match against local rivals the Sonoma Gullies at the Napa Valley Expo in downtown Napa. 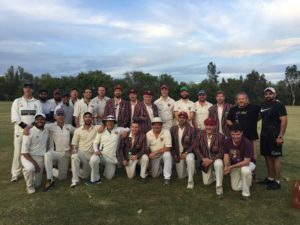 The match, the clubs sixteenth of the season, ended in defeat for the NVCC, the second time that they lost to their Wine Country rivals in 2018. 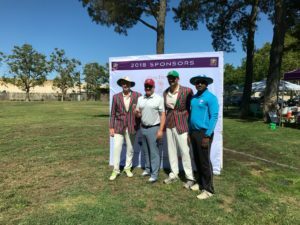 The clubs record for 2018 stands at 5 wins and 9 losses against opposition teams and the remaining match days were made up of the annual intra-club matches – the Napa Valley World Series of Cricket and the City v County matches. The strong American & Australian team of NVCC members won back the World Series trophy convincingly in July. Now in its second season of playing matches at the Napa Valley Expo in downtown Napa the clubs social and playing membership have grown again in 2018 and the club now boasts almost 100 members. The 2018 season started in April with matches on the road in Davis, Bradshaw, and in May matches in Los Angeles at the famed Woodley Park and against Marin CC in Larkspur. With the club’s home fiend at the Napa Valley Expo being used for the Home and Garden Show and then BottleRock the club play their early season matches on the road. Early season highlights saw American member Tyler Nethaway take three stunning catches in the April match against Bradshaw, south of Sacramento, in addition to a stunning direct hit run-out from the boundary rope. A fine knock of 67 runs for Karan Grewal in the NVCC match against the Sri Lanka Lions from Davis wasn’t enough to see the team across the line as he couldn’t find support from the tail-enders. May saw the NVCC travel to Los Angeles to play Malibu CC at the hallowed Woodley Park. Malibu set NVCC 176 to chase in 30 overs and while Grewal (31 off 34) and Jake Radloff (28 off 29) put up a strong fight NVCC ended up 44 runs short. 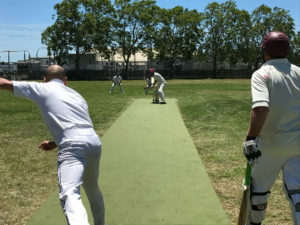 The first of the annual three-match series against Marin CC took place in early June and NVCC were asked to bat first at Piper Park. Only four NVCC players made it into double figures with New Zealanders Jeff Keene (13 off 45) and Bernie Peacock (10 off 12) being joined by Australians Brendan Helme (37 off 66) and Jason Beveridge (19 of 27) and NVCC posted only 106 runs on their 40 overs. Marin chased down the total with time and wickets to spare with wickets for NVCC notched up by Peacock, Harjit Singh, and Grewal. NVCC welcomed the SF Seals to the Napa Valley Expo for their first home match of 2018. A weakened Seals team were no match for a strong NVCC team with NVCC chasing down a total of 95 runs in just 22 overs. The second match of 2018 against Marin CC was hosted at the Napa Valley Expo and saw NVCC limit Marin to 1234 runs thanks to three wickets from Bernie Peacock and two from his fellow New Zealander Tim Mills. With the bat NVCC were rarely under pressure in the chase thanks to 51 off 57 (retired) from Sarabjit Singh and 26 not out off 28 from John Leake winning the match in the 26th over. 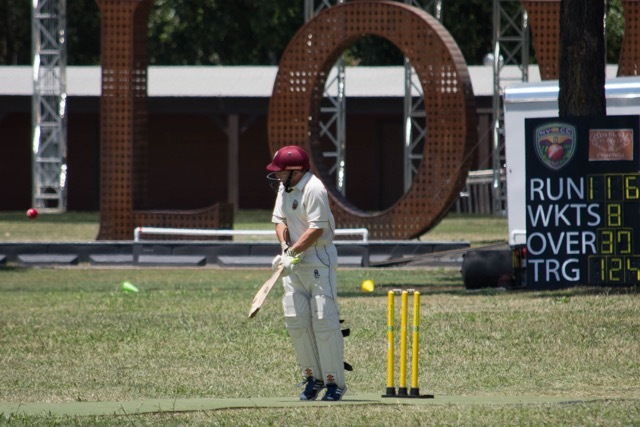 NVCC’s big match of the year, their annual World Series of Cricket, saw a big crowd at the Napa Valley Expo who witnessed a convincing win by the Australia/America team of members. Coming off the back of two consecutive defeats to the Rest of the Word team, AA captain John Leake lead from the front with a 55 ball knock of 49 runs in a team total of 188. In the chase the ROW team never really found any solid partnerships and despite 31 off 29 from Grewal no other ROW batsman made it past 20 runs they ended up 45 runs short. The Sonoma Gullies paid the first of two visits to the Napa Valley Expo in mid-July and, as is their way, won a hard-fought match. 47 not out from the Gullies Sunny Patel was the foundation for a team total of 139 and despite four wickets from Brendan Helme NVCC were unable to reign in their scoring. In the chase despite numerous starts no NVCC player made it past 20 runs, and in the end NVCC ended up 33 runs short. A massive and game-defining partnership of 98 runs by Sorabh Das (55 off 102) and Grewal (49 off 61) saw NVCC post a formidable total of 152 in their August match-up against Marin CC. Three wickets apiece for Bernie Peacock and Grewal, in addition to two each for Adersh Maqsood and Tim Mills saw NVCC dismiss Marin for a total of 126 runs and wrap up the annual series in NVCC’s favor. The return match against Malibu CC at the Napa Valley Expo saw a spirited innings from the touring team get to 170 despite three wickets from NVCC’s Das and two each from Grewal and Bangladeshi Azam Khan. With the bat Das top scored with 35 off 36 but it wasn’t enough with NVCC falling just 15 runs short. The SF Seals got revenge for their earlier loss at the Napa Valley Expo with a record-breaking chase. Set 199 to win, thanks to strong knocks by Martin Mackenzie (53 off 64) and Sukhvirsra Singh (49 off 33) the Seals scraped home with two balls to spare and were the first team to get over 200 runs in a 35 over match at the Expo. The second day of NVCC’s intra-club matches in 2018 saw two T20 matches played as a “City” team of members who live in the city of Napa played a “County” team of members from outside of the city. The County team took the honors on the day in both matches – 126 to 116 in the morning match and 148 to 144 in the afternoon match. With mandatory retirements at 30 runs batting duties were shared through both teams allowing greater opportunity for all. Pick of the bowlers on the day was Bernie Peacock who took four wickets in the two matches. The Sri Lanka Lions, based in Davis, who play in the Sacramento League put almost 200 on the board when the visited and batted first in late September. Englishman Clive Richardson, on a rare appearance in 2018, pulled off what was arguably the catch of the season to dismiss the well-set Naveen off the bowling of Abhijay Aggarwal. Strong batting by the NVCC middle order – Sorabh Das (42 off 31), Karan Grewal (49 off 46) and Harjit Singh (28 off 28) saw NVCC home with just over two overs, and four wickets, to spare. The touring Cliff Cox XI from Vancouver visited Napa on a day when the NVCC’s big guns were firing, both with the bat and ball. Set 175 to chase in 20 overs the visiting team were all out for only 67 runs in 14.3 overs. Autodesk finally made it to the Napa Valley Expo for a 35 over match and notched up 161 runs. The NVCC batsmen had their biggest off-day in history with the top six batters failing to get into double figures. Harjit Singh found some support from the lower order on his way to 55 runs off 37 balls. In particular Irishman Andrew Healy was the perfect foil to Singh with the pair putting on 38 runs for the final wicket with lots of blocking and hard running from the Irishman. The 2018 season for the NVCC wrapped up on October 27th with the second visit of Wine Country rivals, the Sonoma Gullies. The Gullies batted first and racked up 155 runs despite three wickets each for Bernie Peacock and Moe Maqsood. In the chase NVCC never got out of the blocks and fall well short of the target, not even making 100, with a total of 89 runs. Clos du Val, Anchor Brewing, Bill Wagner Realtor, Balanced Business Group, Caliber Home Loans, Compadres Rio Grille, Crown Hill Stone Supply, John Fearless, St. Helena Optometry, Seguin Moreau, TRICOR Braun WinePak, ZAM Apps, 19 Crimes Wine, AZMERA Consulting, Blue Jean Black Design, Left Coast Wine Packaging, Napa Gourmet Foods, 3 rock marketing.